The days are getting sunnier, the air is rich in scents and the colours are bursting – it is like a little prelude to the forthcoming vibrancy of summer. 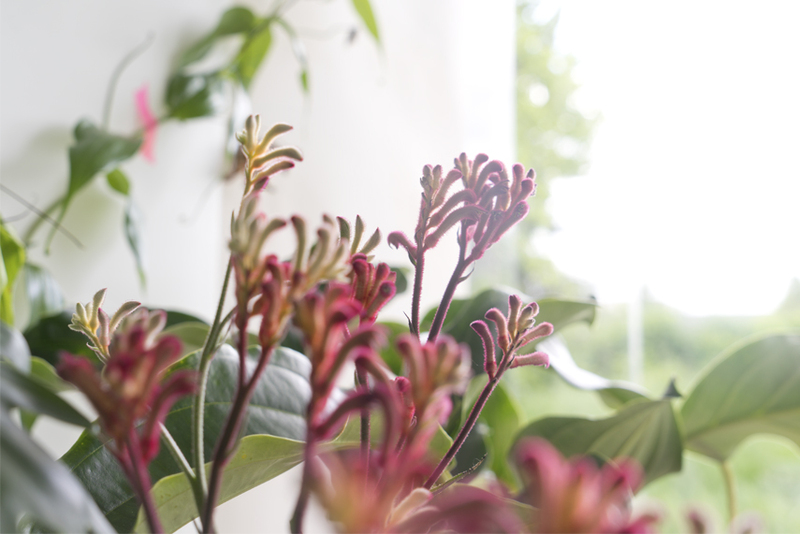 But we plant lovers are already inviting summer into our homes with the “Houseplants of the Month” in May – tropical beauties with lush flowers, juicy colours and impressive foliage. 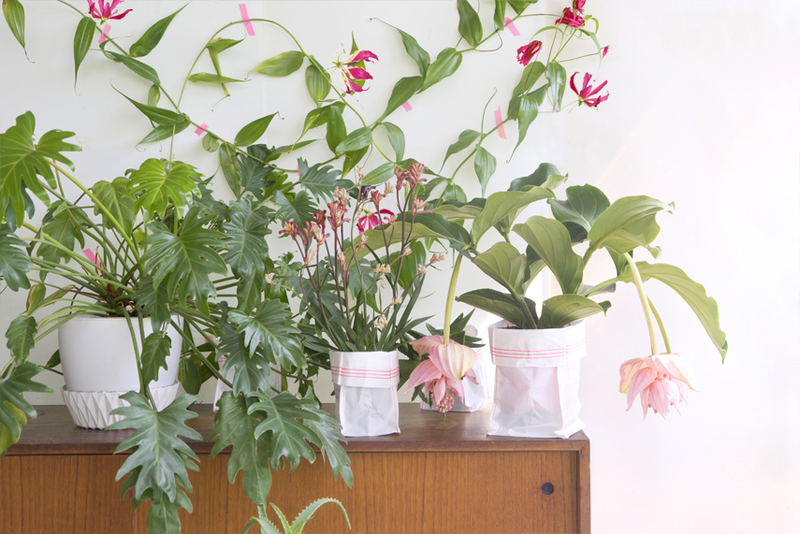 Let us introduce you to this month’s stars the magnificent Medinilla, the glorious Gloriosa and the unusual Anigozanthos. 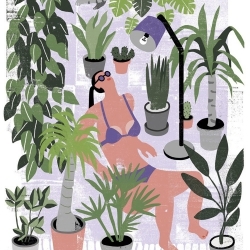 These tropical houseplants offer a real taste of summer in your home. 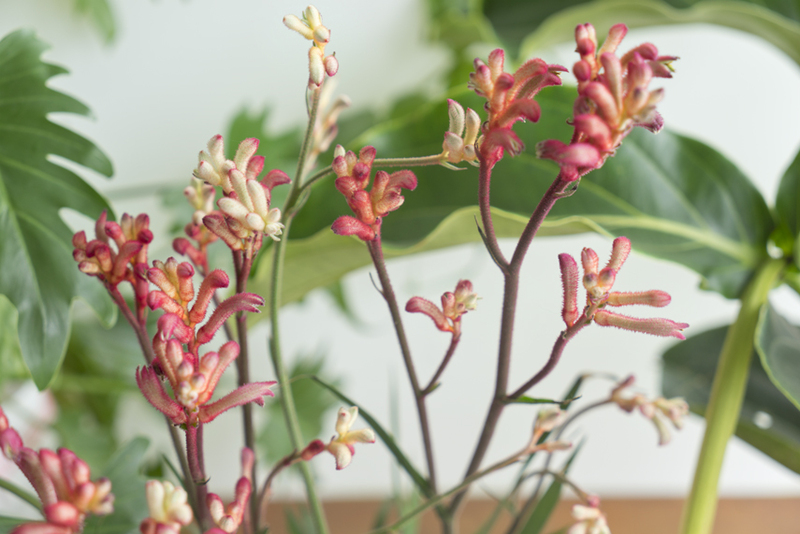 Their exotic shapes are only topped by the remarkable and fascinating colours of their blooms ranging from soft pinks to fiery reds and oranges framed by impressive leaves: from dark green and rippled to corkscrew curls and pointy lances. And if you take good care of them, they will bloom until late summer. A perfect ‘Club Tropicana’ feeling at home! This plant is a real beauty. 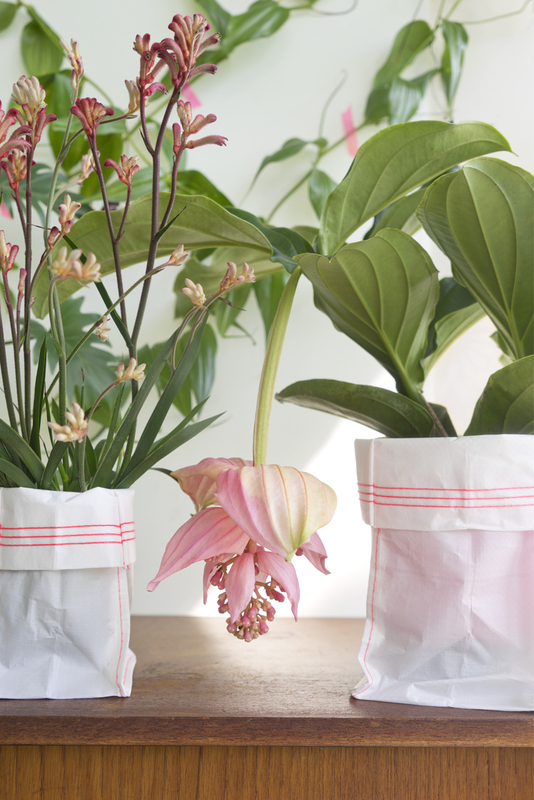 Elegant, luxurious, almost like a real lady, the Medinilla stands out as a houseplant. 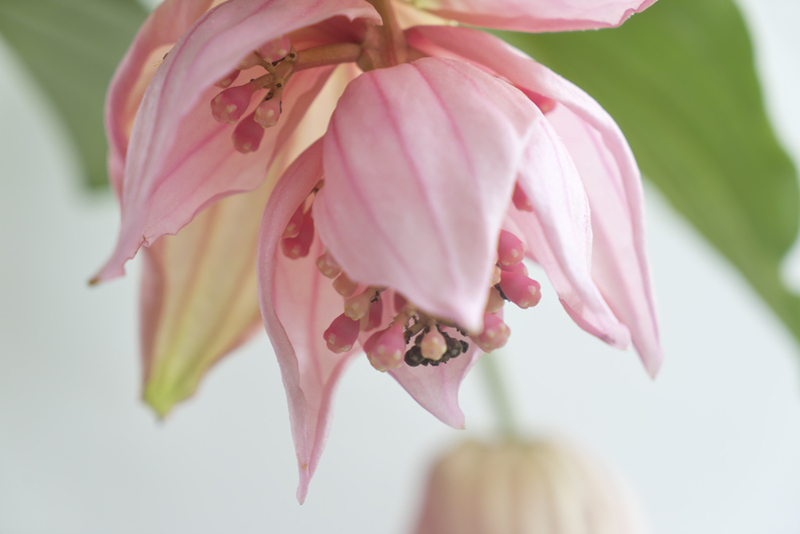 Originating from southeast Asia, the Pacific and tropical Africa this plant is a visual highlight in any home: Its rippling leaves, the square stems growing in high arches and bearing large pink bells that open into a majestic cluster of deep pink flowers. The Medinilla is a fantastic accent plant and perfectly staged all alone in a high position. 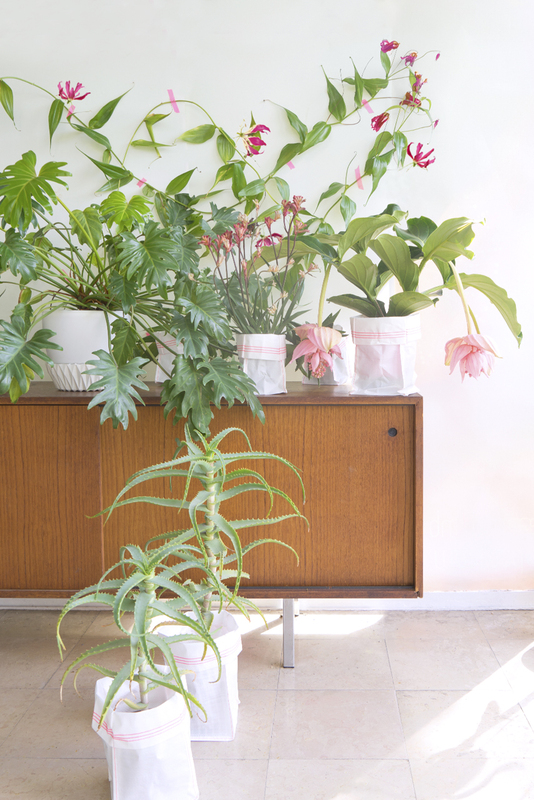 Imagine all the beautiful photo opps with this charming houseplant! This large blooming plant looks glorious with its dark red, bright pink or orange flowers with saffron yellow that seem to float on this climbing beauty from the temperate zones of Africa and West Asia. But not only the flowers are outstanding – the corkscrew curls of the Gloriosa seem to wind and unwind in the search of opportunities to cling to and climb – a real tropical fellow! 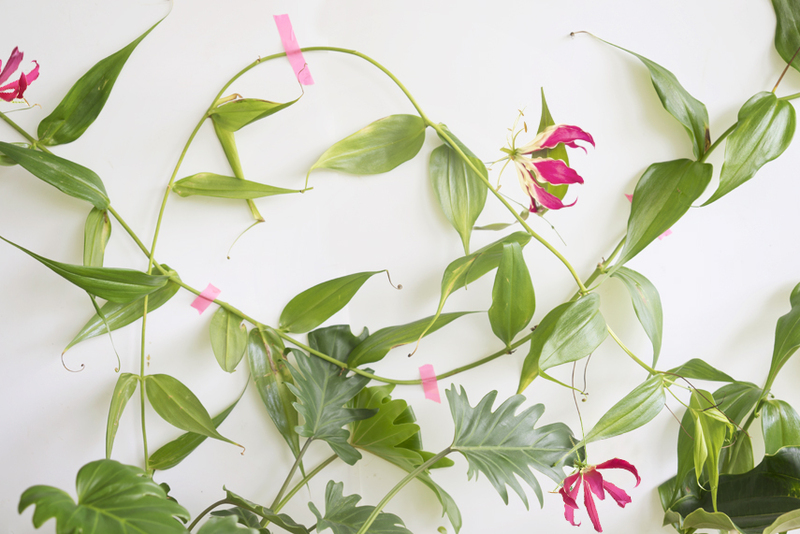 Gloriosa plants are usually sold with curled up vines, you can easily unwind them and let the it grow along a trellis, or stick the branches to the wall with washitape like we did. The Gloriosa also symbolises fame and honour and it is the national flower of Zimbabwe – thus not only beautiful and wise but also of national importance! Some people call it simply kangaroo paw because of the unusual shape of its flowers. It also indicates its Australian origin. The botanical name is somewhat more complicated: Anigozanthos is Greek and means oblique or uneven flower. This desert plant grows in long, branched and leafless stems and at the top of the stems aare whimsical cylinders in red, yellow, orange or pink, covered in hair with fan-like flowers made of six petals. Unusual, decorative and exotic, the Anigozanthos is a real statement plant for urban jungles. Sometimes you might find them at the local florist’s who sell them as cut flowers too. 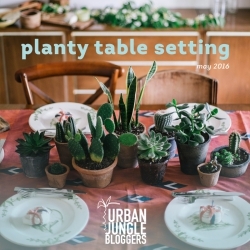 But we Urban Jungle Bloggers love them most when they are potted and growing! 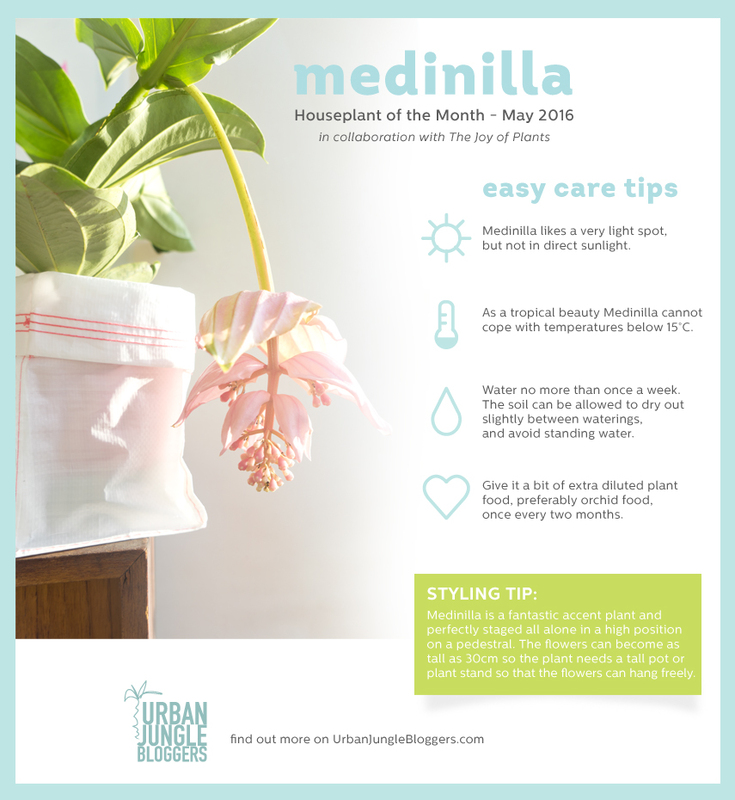 May is a feast for the senses – out in the nature and indoors with our “Houseplants of the Month”. These tropical beauties and desert dwellers will certainly add a dash of exotic feeling of far-away lands and dreamy adventures to any home and they will perfectly mix and match with your existing and thriving bunch of plants. Happy plant styling!